Death Watch | WHAT A FEELING! 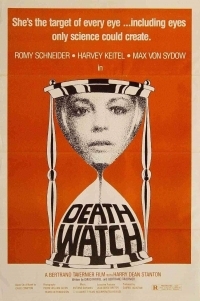 Death Watch has probably disappeared from local screens by now, but it’s an ambitious and interesting film that deserves a little notice. Director Bertrand Tavernier has had three intriguing movies hit Seattle screens in the last few months: A Week’s Vacation (1980) at the Film Festival, The Judge and the Assassin (1975) at the Seven Gables, and Death Watch, the French Tavernier’s first English-language film, at the Crest. Shooting in English seems to have been a bit of a problem for Tavernier, as Death Watch doesn’t flow quite as smoothly as A Week’s Vacation. But there are so many ideas flying around in Death Watch—maybe too many ideas—that it’s always fascinating to watch. For one thing, Death Watch is engaging just in terms of storyline: a TV producer (Harry Dean Stanton) comes up with an idea for a ratings bonanza. He puts movie camera in the eyes of one of his cameramen (Harvey Keitel) and has the guy record the final days of a patient with a terminal illness (Romy Schneider). Schneider doesn’t want her last days filmed, and she tries to escape; when Keitel finds her and stays with her, she doesn’t know she’s being filmed, so her life is recorded, and she becomes the highest-rated show for days without knowing it. An overload of rich cinematic material here, and Tavernier isn’t quite the accomplished juggler to pull it all off—not yet. But the thing remains compelling, a fact that is in large part due to Romy Schneider’s superb performance. Keitel is erratic, and gives a non-directed performance, but Schneider, seen against the stunning landscape of Scotland, makes her private character seem quietly triumphant at film’s end, and leaves behind a record of a very human being. This is a complete coincidence—I just pulled out this review because I was looking for sci-fi titles last week—but apparently Death Watch is currently enjoying a restored re-release in Britain, and getting a little of the attention it failed to get the first time around. It is well worth a look, and Romy Schneider’s performance is special. By the time this opened in the U.S., she was already dead. This entry was posted on Monday, June 11th, 2012 at 3:00 am and is filed under 1980, Actually Good 80s Movies, Sci-Fi. You can follow any responses to this entry through the RSS 2.0 feed. You can leave a response, or trackback from your own site.